While it is natural for people to avoid potentially uncomfortable and stressful life events, they do happen. As Henry Wadsworth Longfellow said “into each life some rain must fall” and sometimes it can seem like it’s pouring. It is at these times (the 4Ds) when a seasoned professional property appraiser and estate appraiser can help provide guidance, clarity, and assurance. The 4Ds refer Death, Debt, Divorce, and Disaster – All are critical reasons you need an estate appraisal or personal property appraisal. The passing of a loved one or close friend, no matter if expected, is always an emotionally difficult event. Depending on the structure of the will or estate plans, it can be critical to retain an estate appraisal expert. If the estate must be liquidated and distributed, various parties and beneficiaries could disagree about the valuation of fine antiques, art, collectibles and other potentially valuable items. Estate Appraisers can play a significant part in assuring that valuations are accurate, thereby protecting the true value of an estate. It happens. Even to some of the most successful people. In 1901 Henry Ford’s first automobile company went bankrupt. He reorganized and today we all know Ford. Walt Disney’s first studio went bankrupt in 1923. But Disney didn’t let that derail his ambitions. Even the 16th President of the United States, Abraham Lincoln, lost nearly everything to creditors. Lincoln didn’t have today’s bankruptcy laws to protect him. In fact, when his creditors took him to court they were awarded his remaining assets: his horse and merchandise/stock. Moreover, celebrities from Kim Bassinger to Francis Ford Coppola have declared personal bankruptcy but in doing so were able to rebuild their net worth. The point is, bankruptcy even happens to successful people. Retaining an experienced personal property and estate appraiser can help you move through bankruptcy more soundly and can reduce the anxiety that comes with it so that you can focus on rebuilding and moving forward. Divorce, in general, just stinks. No one ever goes into marriage with the idea that divorce will happen to him or her. While some divorces are amicable, many are not. Not only should a person going through a divorce have an attorney represent him, but a person in the process of divorce should enlist the services of an experience personal property appraiser. It is important to know the value of personal property when going through a divorce. Disputes over how much physical assets are worth can be a significant stumbling block to reaching an amicable settlement. Without accurate personal property valuation, a divorce can become protracted and transform from being relatively agreeable to a bitter contest. In such cases not only does the emotional impact worsen, but the divorce becomes more expensive for each party as the attorneys on both sides have more work and therefore more billable hours. Consulting with an appraiser can help prevent this and save your resources. 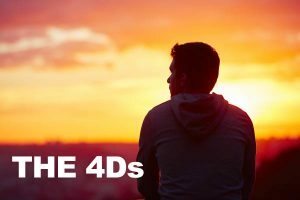 The last D in the 4Ds – Disaster. No matter where you live, you are potentially subject to disasters, both natural and manmade. On the Pacific coast, earthquakes and wildfires can be expected. Along the Gulf of Mexico and the states on the Atlantic coast, hurricanes, fire, flooding and snow/ice can cause disaster. These destructive events are especially distressing as homes can be severely damaged or destroyed and basic infrastructure – electricity, water, and gas – is negatively impacted. In this chaotic whirlwind, your insurer wants to value your claim and settle. Depending on the type of personal property you own, the value could have increased significantly since its last appraisal or valuation by the insurance company. Moreover, in general, insurance claims adjusters are not experts in the valuation of fine antiques, art, collectibles and may not understand or be aware of the actual value of your personal property. When you are disputing an estimate with your insurance carrier, it pays to consult with an expert personal property appraiser and estate appraiser. Doing so can accelerate the settlement of your claim and provide you with proper compensation. Experienced estate appraisers do more than just value personal property; they can help you better navigate some of the most financially and emotionally challenging times in life providing clarity and a steady hand. If you would like to know how we can help you in your time of need, please call us at 713-425-0199.